Remember the public outcry over the Paolozzi mosaics removed from Tottenham Court Road during the ongoing refurbishment of the tube station? The arched mosaics above the escalators are supported by the roof, which is being demolished as part of the station upgrade. TfL even looked into taking down each of the tiles individually, but because of the type of mortar they’re set into, only 5% of the tiles would come away undamaged. Which is a pretty good outcome by most people’s standards. 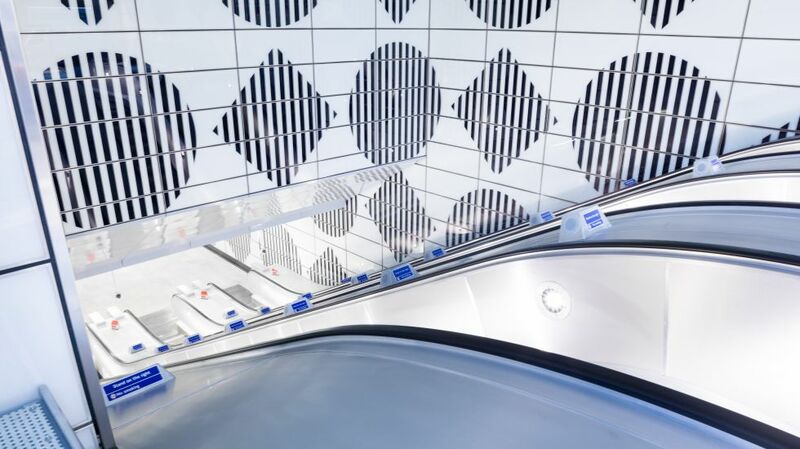 Next year, the remaining Paolozzi’s mosaic at Tottenham Court Road will be joined by work from the artist, Daniel Buren, situated around the Oxford Street and Charing Cross Road entrances as well as the ticket halls. You can see what this will look like here. “We have worked hard to ensure that 95 per cent of the mosaics are retained at the station, and now have a fitting home for the remainder, through which the pieces will have a new lease of life.